The United States and most of the developed world have benefited tremendously over the past 30 years from a steady drop in long-term bond rates. Even the potential for a small retrenchment in this extended bull market would have highly negative consequences for the global financial system. The world has changed dramatically since the 1970s in some critical respects. In the United States total public and private debt as a percentage of gross domestic product more than doubled from 150% in 1965 to a peak 384% in 2009. Other economies such as the UK and Japan have even higher debt ratios. As a result the financial system is far less stable than it was in the 1970s and far more subject to external shocks. When/if the period of benign interest rates ends, there is significant risk that rate moves will be far more violent and far more rapid than experienced in the 1970s. The other critical factor that differentiates the current period is that global financial institutions are far more leveraged and interconnected than they were in the earlier decades. 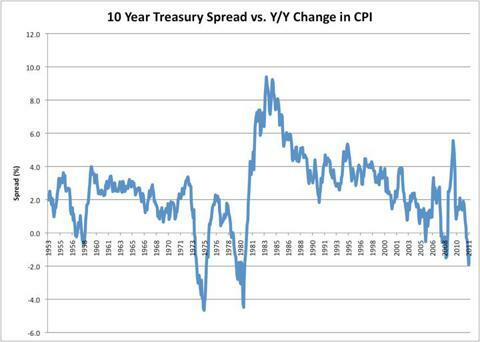 The current yield curve is a historical anomaly. 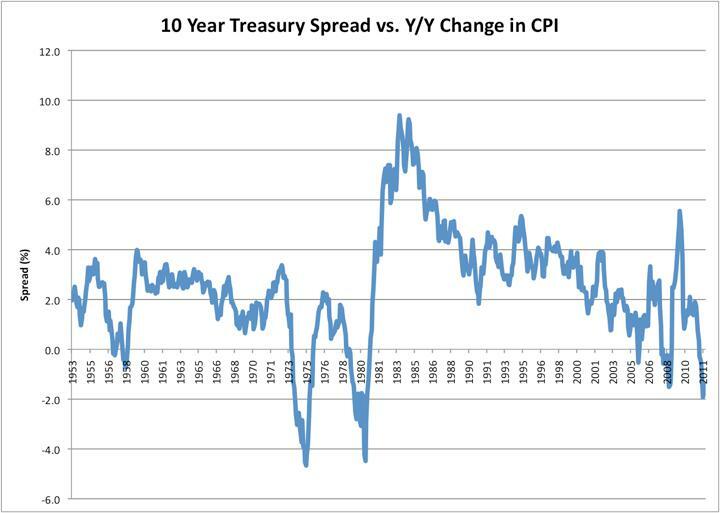 With inflation averaging between 1.4% and 3.2% in 2011 and 2012, long term treasury bonds should not be trading anywhere near their current levels. 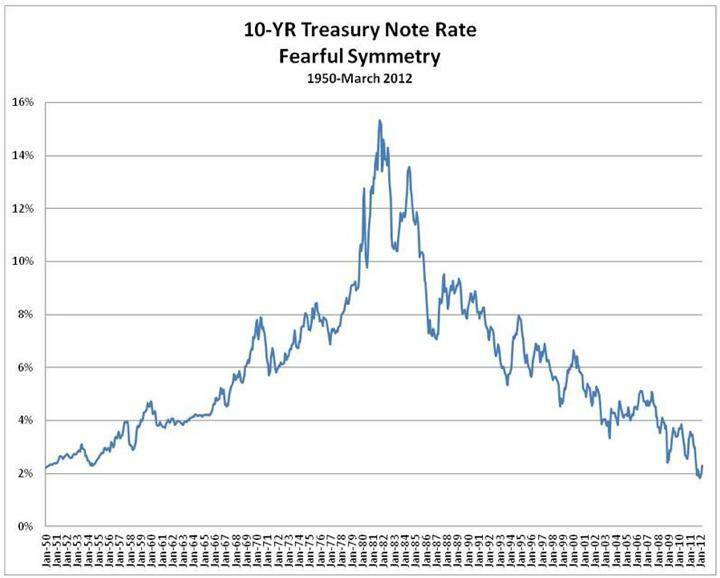 As an example the 10 year traded to yield 1.82% on August 17, 2012. By comparison the 10 year traded to yield 5.40% on August 17, 1998, a year in which inflation averaged 1.6%, close to the July 12 month CPI print of 1.4%. On August 16, 2002, another year in which inflation averaged 1.6% the 10 year yielded 4.32%. A combination of global quantitative easing and capital flight to the few currencies and markets perceived as strong, has enabled the Fed to maintain a historical anomaly in long term rate behavior and the market clearly believes that they will continue to do so. Without considering the possible impact of an increase in inflation on long term rates, what if 10 year interest rates were just to move from their current levels to a more normal, but conservative 250 basis point premium over inflation? That would put the 10 year at 3.9%, implying a price drop for the 10 year bond of a bit over 9%. 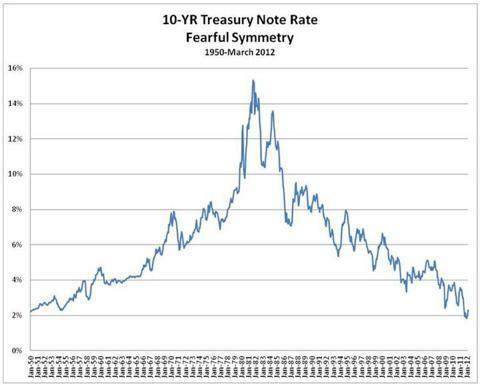 An average 290 basis point spread for the thirty year would result in a price drop for the long bond of 21%. What does that imply for the financial markets? Despite ample evidence to the contrary, financiers in every cycle assume that they can beat the odds by borrowing short to lend long. That’s what killed the savings and loans and similar investment patterns had been responsible for numerous other financial crises. While risk managers and regulators understand the risks very well, it seems highly unlikely that somewhere within the financial system bondholders are not succumbing to the temptation to take advantage of the arbitrage of 0% short-term rates against higher long-term rates. We know this is happening because hundreds of billions, perhaps trillions of dollars of mortgages have been refinanced as thirty year fixed obligations at very low interest rates. Someone is taking that long-term risk. Certainly much of it is been taken by the Federal Reserve through Operation Twist and other mechanisms, but almost certainly a meaningful portion of the term risk has been assumed by highly levered financial institutions and hedge funds. A likely method of transmission for this risk is the interest rate derivatives market, where total nominal exposure by US banks was $183 trillion with approximately 93% held by just four banks at the end of Q1 2012. With some large financial institution Tier 1 capital ratios still below 10%, a 9% swing in a material portion of their asset portfolios could have a significant earnings impact. For the economy as a whole, were such a move to occur quickly, it would constitute a Black Swan event at least as significant as that experienced in 2008. As I write this it’s a gorgeous August day. After 2 months in the high 90s and 100s, it’s 83°. This happens most years and I know that we’re still in for quite a bit of hot weather between now and fall. But this taste of cool weather provides me assurance that fall is coming. I’m not predicting that a one month of volatility in the bond market will inexorably lead to a rapid move up in interest rates. However, like this gorgeous August afternoon, prudent investors should consider the possibility that the past month is a foretaste of a likely change in weather down the road.